The temple of Yamuna was built by Maharani Guleria of Jaipur during 19th century. It was rebuilt following its destruction during early period of the last century. The temple at Yamunotri (3,291 m) stands on the western edge of the Bandarpoochh peak (6,315 m) in Garhwal Himalayas. The sacred river of Yamuna originates from Yamnotri glaciers. Mythologically Yamuna is the daughter of the Sun just like Yama who is also considered his son. It is believed that Yama would not torment any person at the time of death who bathe in Yamuna that is his sister. Near freezing Yamunotri glaciers there are steaming hot spring known as Kunds. All this present divinely control over the entire setting. Surya Kund is the most important Kund. A pinch of rice or some potatoes tied loosely in a cloth and dipped in it and after few minutes is taken out gets completely cooked which is normally taken as 'Prashad' back home by the pilgrims. Near 'Surya Kund' there is 'Shila' called 'Dibya Shila' which is worshipped before Puja is offered to Yamuna ji. Nearby, there is Jamuna Bai Kund built about 100 years ago which is used for the holy bath. The water come is pleasantly warm and relaxing. The 'Pandas' or the Pujari of Yamnotri come from the village of Kharsala which is on the other bank of Yamuna near Janki Bai Chatti. The Chardham Yatra starts from the first week of May till the month of November, it closes for the next six month due to Cold climatic condition. Light Woolen from May to July. Heavy Woolen from September to November. The sons of the King Sagar searched for the horse and finally found it tied near the meditating sage. Sixty thousand angry sons of King Sagar stormed the ashram of sage Kapil. When he opened his eyes, 60,000 sons had perished by the curse of sage Kapil. Bhagirath, grand son of King Sagar, is believed to have meditated to bring down the Ganga which brought back sixty thousand sons into life. The Bhagirathi, 'Shila' is located near the temple of Ganga where the holy Ganga first descended on earth trom heaven. Hence the place is known as Gangotri. 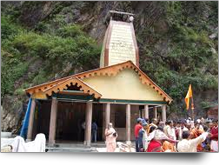 The temple of Bhagirathi was erected by the Gorkha General, Amar Singh Thapa in 18th Century at the source of Ganga. The other places of pilgrimage are Surya Kund, Vishnu Kund and Brahma Kund located in the vicinity of Gangotri. Bhaironghati (2743 m) is a halting place if one wants to reach upto the height of Gangotri. Gangotri glaciers (4238.6 m) starts trom Chaukhamba cluster of snowpeak and extends upto Gaumukh which is connected by a track trom Gangotri. Whether one believes in these legends or not, the properties of Ganga water are well known all over the world. The water of Ganga contains no impurities and remains uncontaminated even after being kept over several years. Scientists attribute this to secretion of herbs, geologists to its mineral content and the Hindus to its holiness. Yatri also halt at Uttarkashi, Sukhi Jhala, Harsil, Gangnani. A number of Ashrams along the bank of Bhagirathi, Tourist Rest House, PWD Inspection Bungalow, Forest Rest House are available. Dharamshala, Guest House and Private Hotels also ensure convenient accommodation, at Gangotri. The magnificent temple of Kedarnath (3581 m) one of the twelve Jyotirlingas of Lord Shiva, is dedicated to Sadashiva, a form of Lord Shiva, is situated in Garhwal Himalayas (Rudraprayag district). While huge statue of Nandi stands in the court yard, the images of Pandavas and Droupadi are skillfully carved on the wall of the temple. There are number of 'Kund' in Kedarnath Peeth. Shiv Kund is the prominent one. Rudhir Kund is known because of water being of red colour. 'Purandar Parvat' divides the area around Kedamath temple which are known as 'Narayan Kshetra' and 'Sakambhari Kshetra'. 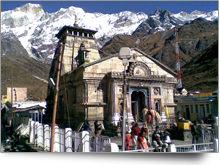 Some other places of pilgrimage are Tungnath, Rudranath and Kalpnath. The whole Kedamath valley (2 km x 1/2 km) is surrounded by snow covered peaks from three sides and it lends a unique setting to this divine place. Mandakini glaciers and Gandhi Sarovars are only few kilometers away from Kedamath. According to legends, the shrine of Kedamath was built by Pandavas after Mahabharat war. The present temple was built in 8th century AD by Adi Shankaracharya. It is believed that Sadashiv escaped from the clutches of Pandavas and took refuge here in the from of buffalo and finding himself hard pressed dived into the ground and left certain parts of his body at four other places along the Himalayan ranges i.e. the arms (Bahu) at Tungnath, the face (Mukh) at Rudranath, the belly (Nabhi) at Mad Maheshwar and the hair (lata) and head at Kalpeshwar. Together with Kedamath all these temples are called 'Panchkedar' and are worshipped by Hindu devotees during their pilgrimage. Chardham Yatra starts from the first week of May till the month of November, it closes for the next six month due to Cold climatic condition. Some poeople hire ponies, some get carried in little boat-shaped things by groups of 4 men, and some (small and light people) get carried in a wicker basket,from Gaurikund. Yatri also halt at Gupt Kashi, August Muni, Phata, Rampur, Sita Pur, Gaurikund. 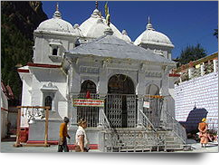 The Badrinath temple was constructed and renovated by Shankaracharya some time in 8th century during his pilgrimage to Badrinath and Kedamath after he had established 'Jyotirdham' in Joshimath. There is a 'Tapt Kund' with hot water which has to be mixed with cold water before taking bath. Narada Kund, Surya Kund, Basudhara, Mata Murti and Charan Paduka are the other holy places of attraction for the large numDer of pilgrims who visit Badrinath every year. About 8 kms from Badrinath in the west, there is a group of snow peak called Choukhamba with height up to 6700 m. There is another peak called Neelkantha about 9 km. south west of Badrinath. The temple of Badrinath is visited by about six lakh pilgrims every year. There is a plan to make a village complex for the pilgrims at an estimated cost of rupees one crore. Presently hotel Devlok has been constructed at Badrinath to provide board and lodging facilities to pilgrims. Bhavishya Badri : (2744 m). The place in 19 km away from 10shimath which is suppose to be an alternative seat of Lord Badrinath ji if for some known reason 'Badrinath' shrine disappears. An image. of god 'Narsing' is kept here which is worshipped by the devotees coming from TapovanDhauliganga side Pilgrims have to trek for 6 km to reach the shrine. Yogdhyan Badri : (1920 m). 23 km short of Badrinath shrine located at Pandukeshwar. It is here that king Pandu is believed to have meditated after their victory over 'Kaurvas' and before leaving for his heavenly abode. Vridha Badri : (1380 m). 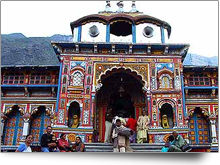 This is the first holy place of Lord Badrinath ji located at Animath. Animath is 8 km short of 10shimath approachable by motorable road. Before Badrinath was designated one of the four 'Dhams' of Hindus by Adi-Shankaracharaya, the idol of Badrinath ji was woshipped here. Vridha Badri remains open throughout the year. Yatri also halt at Nandprayag, Pipal Kothi, Joshimath.Dharamshalas /Hotel / Vyapar Mandal and Tourist Rest House are available for a comfortable and economical stay at Badrinath.